In my UI, I have a project tree that contains a list of components that are in a project. Once my current spec is done running I’m calling a page object function to delete all the components to clean up the workspace before moving on to the next spec. I’d say about 50% of the time I’m noticing a stale element reference error on the line with my .filter() function. I added some log statements to see if I could figure out what’s happening and noticed some behavior I didn’t understand. It seems like for every component in my list, the filter function is running four times. Anyone know if this is expected behavior? When I turn on the debug logging here is what I see in the console. Why does it seem like each component is running through the filter function 4 times? 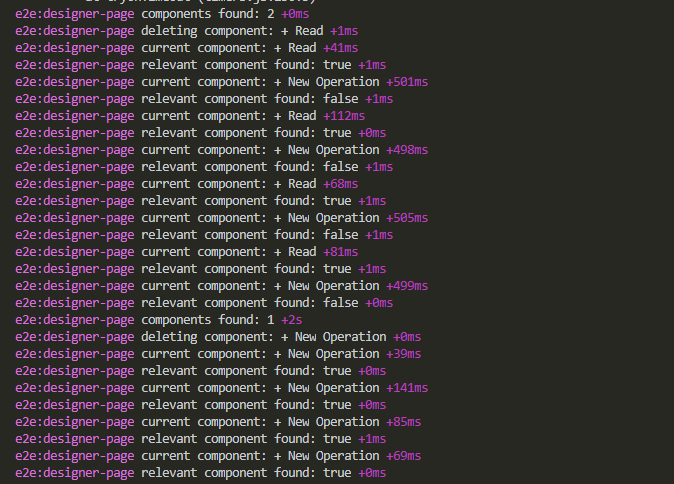 When there were 2 components found the function ran 8 times, when there was only 1 it still ran 4 times. What’s this all about?